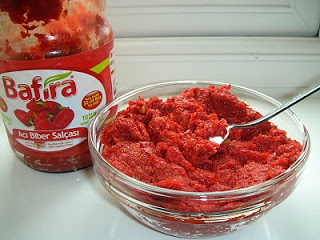 The red pepper paste is available thru the Middle Eastern markets, and the Turkish website www.tulumba.com carries them too. In London, Tas Organic carries a wonderful red pepper paste in jars, and I have been very lucky to get great batches of them, thanks to my sweet sister-in-law, Judith. In the US, Phonecia Bakery (in Austin and Houston) and Sarah’s Deli in Austin carries them. In case if you can’t get hot red pepper paste, here is a simple recipe (an adaptation from Greg and Lucy Malouf’s wonderful book, Turquoise) to make at home. Preheat the oven to 400 F. Roast the peppers and the seeded chiles for 20 minutes on a tray. Turn them once, until the skins blister and char. Remove from the oven and leave to cool. When cool enough to handle, peel the skins away from the peppers and pull away the seeds and membranes. Roughly chop the peppers and put into a blender. Use a sharp knife to scrape the flesh of the chiles away from the skins – this is easier than trying to peel them – Whiz to a fine puree, then add the salt, pepper and the lemon juice. Cover and keep in the fridge. This should keep the fridge for a week or more. Ozlem, congratulations on your amazing blog! My foodie friends and I are so thrilled bout it. Your recipes are the best. I became a Turkish food lover after I attended your cooking class. I understand you’re very busy, but are there any chances of you writing a cook book soon? What a better way to pass your recipes to present and future generations. Thanks again for all the wealth of information you share with us. G’day! I was glad when I came across your wonderful website via Google. I plan to make your Biber Salcasi in a Borek recipe I want to try next week! Look forward to my follow up too! Thank you for inspiring me to do! G’day to you too Joanne, many thanks for stopping by! So glad you will have a go at biber salcasi, I use it almost daily, adds so much flavor! look forward to hearing how it came out in your borek, many thanks! G’day! Thank you for inspiring me to make Borek with meat with your Biber Salcasi for the first time! Would HIGHLY recommend people make TRUE! Here’s a photo and what I wrote about this wonderful recipe too! G’day to you too Joanne! Thank you so much for your kind note; i am over the moon that you tried the recipe and enjoyed it : ) I just visited your website, your borek looks delicious, so glad it inspired – thank you for taking the time to write! Merhaba, what’s the difference between moroccan harissa paste and biber salcasi? Thank you for the recipe. i have a question though. chillies and peppers always confuse me as there are so many kinds. can you please tell me the ones used in this recipie. i assume you are not talking of red capsicum (or bell pepper). Also, are you using green chillies here or red chillies. Hello Nishant, not a problem at all, I am glad you asked – it is the combination of pointy red peppers (which tend to be sweet) and red chili peppers I use here, to get the flavor balance, I hope it helps and you enjoy it : ) If you like it spicier, you may add more red chilies if you like. Thanks for the quick reply Ozlem. Btw, can you post a recipie for Adana Kebap. Chicken prefrable. Hi Ozlem! I love turkish food and love your blog. I visit Istanbul frequently and in my last trip, I bought Biber Salcasi. And a big tub too! After going home, I realized that this may not be what most dishes use and wha I should have gotten was a sweet red pepper paste and not red chili paste. For example, which paste is used in Kisir? Some blogs use the sweet and some use spicy. Are the two interchangeable in recipes based on personal preference? I watch my neighbor in Sarimsakli every summer make this..she sits a tray or two in the sun on the balcony. It takes around two weeks to make.